Saturday I and a half-dozen or so other people built Blubber Bots at a Machine Project workshop, led by Jed Berk (the Blubber Bots are descended from his ALAVs, previously on lemonodor). It was so fun! And my blimp is my new favorite robot. Flying robots really are the best. They don't care about stairs or raised floor thresholds (poor Roomba). 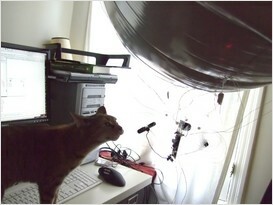 A small blimp makes an excellent indoor robot pet platform, and Jed's design makes the most of it. I always wondered what kind of control authority a blimp would have, and while the Blubber Bot is kind of like a clumsy airborne manatee, it's actually pretty good about seeking out light and backing away from obstacles that trigger its pink pom pom-tipped bump sensor. When it detects a cell phone call (the phone has to be within a few inches of the sensor) it goes into dance mode, spinning in place and playing a tune. I spent 45 minutes just watching the thing fly around my apartment—more than any other robot I've worked with it's very easy to anthropomorphize. More photos here and here. Kits are available from Make. I claim priority! 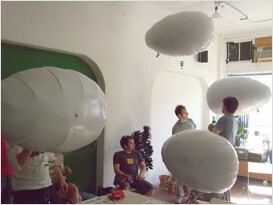 Our group build a robot blimp at the MIT Media Lab in the mid-80s. It was driven from a visual programming language running on early Macs, later from MCL, communicating via RC controllers. It had sonar rangefinder sensors, too. Fun times. mt - would that language have been Prograph, by any chance? Actually not, it was Hookup!, developed locally and later commercialized. It was optimized for real-time applications (music, video, and the occasional blimp).